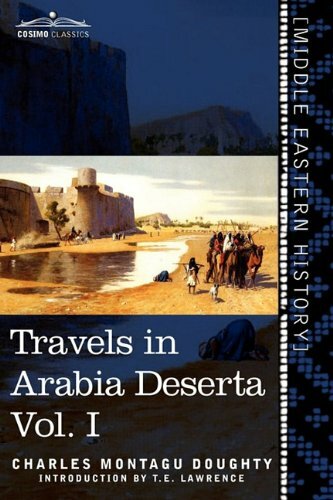 Travels in Arabia Deserta, originally published in 1888, is a two-volume set which describes English poet Charles Doughty's extensive travels through the Arabian deserts and the discoveries he made there. The work became well-regarded for its beautiful prose as well as its extensiveness, which made it a benchmark of ambitious travel writing in the early 20th century. Written in the style of the King James Bible, the text is extravagant and creative. In the 1920's, it was discovered by British Army Officer T.E. Lawrence, who spurred the book's republication, this time with an introduction from Lawrence. The book has been in and out of print since then, but the Cosimo edition is a rare 1921 reprint, and includes the Lawrence introduction. Volume I includes T.E. Lawrence's Introduction, as well as accounts of Doughty's treks to Mecca, Ammon and Moab, the Mountain of Edom, Arabia, the Passage of the Harra, Teyma, and more. He also describes nomad life in the desert and ancient stories, peoples, and myths connected with his travels.